In late April, the Pacific Islands Fisheries Group met with seven bottomfishers in Port Allen, Kaua‘i. It was a beautiful day in the low 80s at the Port Allen Fishing Club clubhouse. The winds were light and variable, with buoy 51003 indicating a declining late season swell of six feet out of the North-Northwest. And we were fortunate that these fishermen took time away from the ocean to share some stories about bottomfishing in Hawai‘i. What is different about Kaua‘i bottomfishing? We wanted to know what makes bottomfishing around Kaua‘i different than the other main Hawaiian islands. As one Kaua‘i full-time commercial fisher explained: “[the] weather, water conditions are a little different around Kaua‘i, which makes fishing a little rougher and there’s less boats because of that.” Kaua‘i bottomfishers seemed to embrace the rougher water, particularly those making their living bottomfishing: “if the fish are biting, you’ll fish in anything.” As another explained: “if you’re waiting for light and variables, you’re going to go broke.” To make your living bottomfishing on Kaua‘i, you’ve got to put in the time out on the water. That water is often rough; you better learn how to deal with it. Many of the Kaua‘i bottomfishers described the adverse ocean conditions and strong currents that they must deal with on a consistent basis. They must learn to read and navigate these currents, since bottomfishing requires anchoring or slowly drifting to ensure that baited hooks reach preferred depths and habitat for Deep-7 bottomfish. As the bottomfishers explained, the currents around Kaua‘i bottomfishing areas can be complex, sometimes moving fast on the surface, but perhaps not moving at all down near the bottom, which can make drops challenging. As one bottomfisher explained, “they only bite at certain currents,” perhaps because of the difficulty of placing their bottomfishing rigs on the precise spots where the fish may be located. Although this may stress the importance of timing, another bottomfisher explained the importance of patience: “The most important thing to me is to be patient. Patient in finding fish, getting fish to bite, waiting for currents to die, currents to change. All of that consumes a whole lot of time.” This patience may lead to fleeting moments when the fish are really biting. You have to be there when that happens if you want to make a living bottomfishing. Another bottomfisher stressed the importance of location, bathymetry, and currents: “[you] need to know grounds, the structure, the currents. The tide changes, get a gold rush, then it slows down.” In other words, there are a lot of variables to factor in when you’re bottomfishing. The next time you complain about your rough commute to work, think about trying to navigate a channel in 30’ seas and 120 knot winds – during a hurricane. To make a living bottomfishing on Kaua‘i, some of the folks we interviewed put in 340-350 days of the year fishing. When you spend that much time out there, something scary is bound to happen. It’s just the law of averages. 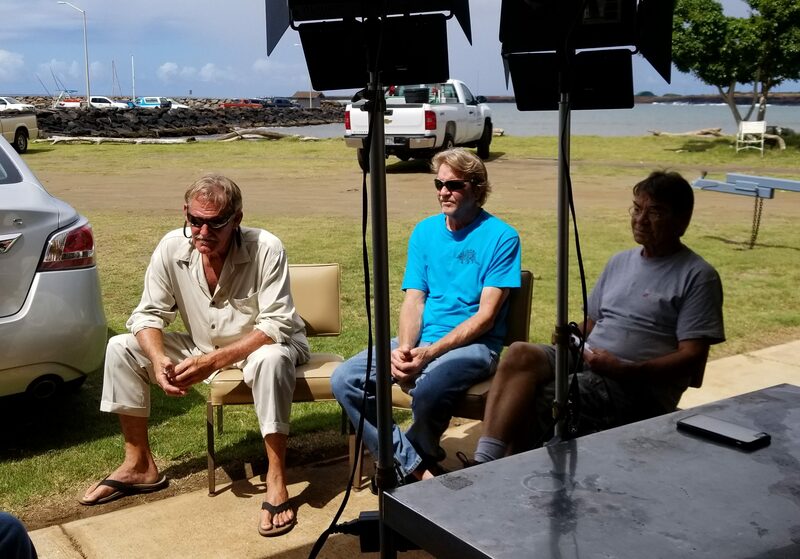 Steve Arnold and Dan Klintoff told us about driving their boat from Kaua‘i to O‘ahu in September 1992 prior to the landfall of Hurricane Iniki. Iniki was the most powerful hurricane ever to hit Hawai‘i. At its peak, wind speeds reached over 140mph. The storm made landfall on Kaua‘i, where it was responsible for six deaths and $1.8 billion dollars in damages. Dan: We went through Hurricane Iniki on our boat. That was a very scary time. Steve: If you remember the Iniki circumstances, the storm turned and doubled its speed. 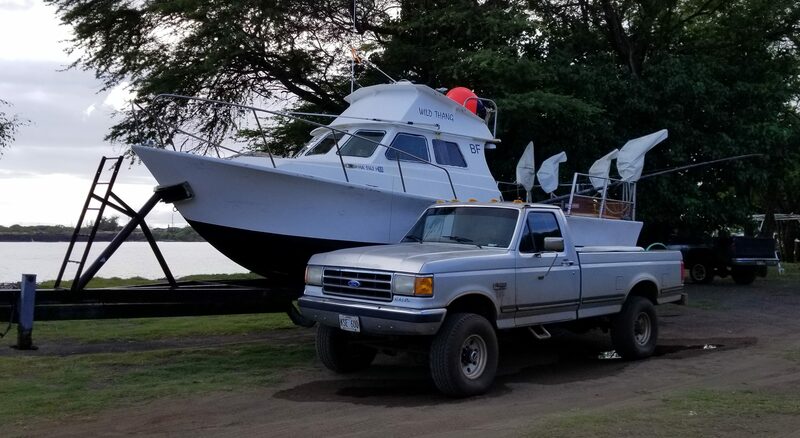 We thought…we didn’t have insurance on our boat, so we thought we’d go to O‘ahu and it would be safer there. 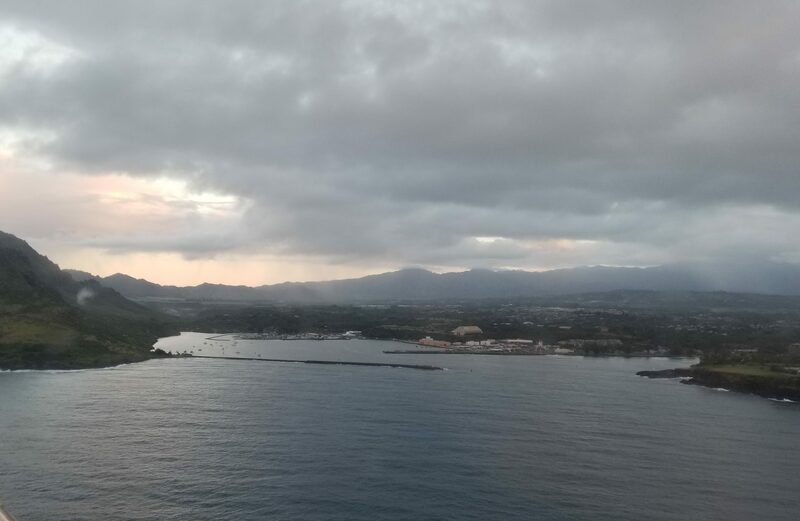 Anyway, we were about off of Waianae when we realized that we weren’t going to make it. We were off of Barber’s Point when it was kicking up to, what did they say, 160 knots? Dan: I remember the Navy said we were in 125 knots of wind and 25 foot seas and we were off of Ka‘ena point. And they um…All of the buoys had got drug off of everywhere. And they let us into Pearl Harbor. We parked the boat right where the Missouri – this was before the Missouri was there – and they let us in. We parked the boat there and they came down with coffee and blankets for us. Steve: But the hairy part was going into the entrance because there was at least 30’ breaking waves we had to go through. And the boat is really slow and it was three miles out these things were breaking. So we had to go through that kind of stuff for you know, 30 minutes. We got hit by three from behind, that rolled the boat all the way onto its side, surfing down the wave, with the flybridge…the flybridge was curved, I think that was a lucky thing, because it uh, it didn’t dig in. Because if it digged in, it would have rolled. Dan: We actually blew out a window. Steve: Yeah we blew out a window. Dan’s down there holdin’ the window in, I think he used a Stanley screw gun to screw it back in, but he’s still holding it. The whole time he’s doing this. It was scary. Dan: That was probably the scariest thing. Although this story may seem crazy, it’s merely one of many incredible stories Hawai‘i bottomfishers have contributed to the Bottomfish Heritage Project. We thank the Kaua‘i bottomfishers for sharing their time and stories with us. Stay tuned for more updates from the other islands. Please follow our socioeconomics blog so you don’t miss anything. This project is supported by NOAA Preserve America Initiative and a National Marine Fisheries Service Pacific Islands Region Cooperative Research grant. For more information about other research from the PIFSC Socioeconomics Program visit our website or browse recent blog posts. This entry was posted in Socioeconomics and tagged #BFheritage, #BFISH, #BottomFish, Adam Ayers, BMUS, Bottomfish Heritage Project, bottomfishing, cooperative research, Cooperative Research Program, culture, Danika Kleiber, Deep 7, Deep 7 Bottomfish, Deep7, ecosystem science, Ecosystem Sciences Division, ehu, ESD, fishing stories, fishing traditions, gindai, hapu'upu'u, Hawaii bottomfish, Human Dimensions, Justin Hospital, kalekale, Kaua`i, Kirsten Leong, lehi, onaga, opakapaka, oral history, Pacific Islands Fisheries Group, Pacific Islands Fisheries Science Center, PIFG, PIFSC, Port Allen, Port Allen Fishing Club, Preserve America, social science, Socioeconomics, Socioeconomics Program, Uku, Voices From The Fisheries. Bookmark the permalink.